GPS geolocation for emergency calls (112). Free subscription to the phone pack (see details below). Subscrition is open since the 28th of December via your customer account, tab Manage my subscription. The phone pack allows you to receive phone calls and text messages straight on your Inforad. 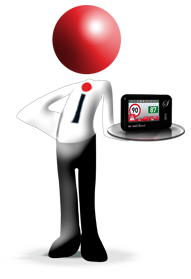 Your Inford will have its own phone number and will work as a hands-free phone. However you won't be able to receive the phone calls from your mobile phone number.